Results of tuberculin skin test (TST) surveys among different populations have been reported in many studies as a method for detecting primary Mycobacterium tuberculosis infection. Combining these results provides reliable estimates of primary latent tuberculosis (TB) infection for health policymakers. This study aims to estimate the prevalence of latent TB infection in general and high-risk populations in Iran. National and international databanks were searched using specific keywords. After restricting the search strategy, duplicates exclusion, reviewing titles, abstracts and full texts, and quality assessment, eligible papers were selected. The heterogeneity between the results was assessed according to Cochrane and I-squared indices. The prevalence of positive TST reactions was estimated using fixed and random effect models. Totally, 33 papers were entered into the meta-analysis reporting the TST results in 12693 people aged over 18. The prevalence (95% confidence intervals) of positive TST reactions in all groups, general population, health staff, medical students, household close contacts, patients with TB, immunocompromised patients, HIV/AIDS patients, and those with risky behaviors was 26.2% (19.6–32.8), 25.4% (4.8–46.1), 38.9% (27.4–50.9), 13.4% (9.9–16.7), 35.9% (16.4–55.5), 13.7% (8.4–18.9), 29.4% (21.2–37.7), and 14.6% (3.9–25.3), respectively. Our study showed great varieties of positive TST results among different Iranian subpopulations. Furthermore, the prevalence of latent TB infection among health professionals and family members of TB patients was considerably different from that of the other subgroup. Since TB control programs such as active case finding are routinely conducted among household close contacts and HIV/AIDS cases, other high-risk groups including health-care workers and immunocompromised patients should be taken into consideration in these preventive programs. TST is a reliable and standard method widely used for diagnosis of latent TB infection. It is also useful in the evaluation of those suspected to TB with negative MBT cultures. In this test, 0.1 ml of an antigen including purified protein derivatives (PPD) is injected intradermal into the anterior forearm. The size of the skin reaction (induration) is measured after 48–72 h.
Many TST surveys have been carried out in Iran to estimate the latent TB infection among different subpopulations such as general population, health workers, medical students, and high-risk and immunocompromised patients. Systematic combining the results of these studies using meta-analysis,, provides reliable evidences required for TB control programs. This study aims to estimate the frequency of positive TST reactions in general and high-risk populations (health and treatment staffs, medical students, household close contacts, immunocompromised patients, HIV/AIDS cases, and people with high-risk behavior) in Iran. To increase the number of eligible articles, references of these studies as well as nonelectronic articles were investigated. Moreover, some research centers and experts in the field of infectious diseases were interviewed. The search results were evaluated by a third researcher for detecting any ignored relevant article. Full texts or abstracts of all studies identified during the advanced search were extracted. After excluding duplicates, we investigated the remained articles reviewing titles, abstracts, and full texts. We also reviewed the findings of the articles to prevent reprint bias. The articles selected during the above steps were quality assessed using STROBE checklist. This checklist contains 22 questions including different aspects of methodology. The total quality score of each paper varied between 0 and 44 classified into low quality (<15.5), moderate quality (15.5–29.5), and high quality (30–44). Low-quality studies were excluded from the meta-analysis. Titles, first author name, date of study conduction, sample size and sampling method, study design, study language, study subgroups, mean age and age range of participants, cutoff point for diagnosis of latent TB infection, time of reading the TST results, frequency of TST reaction sizes (0–5, 6–-9, above 10, and above 15 mm) were extracted from each study and entered into the Excel spreadsheet. Studies written in English or Persian reporting the sample size and prevalence of positive PPD test (>5 mm for HIV/AIDS cases and >10 mm for others) among Iranian population aged >18 years and achieved enough quality scores were included into the meta-analysis. Studies did not report the sample size and frequency of cases with positive TST, case reports, case–control and experimental studies, studies carried out among populations under 18, and those with low-quality scores (<15.5) were excluded from the meta-analysis. All statistical analyses were performed by Stata version 11 package (StataCorp, College station, TX, USA). Standard error of the frequency of TST results was calculated based on binomial distribution rule. The heterogeneity between the results was assessed using Cochrane and I-squared (I2) indices with P < 0.1 as significant heterogeneity. The I2 index <25%, 25%–75%, and >75% were considered low, moderate, and high heterogeneity. Based on the results of the heterogeneity studies, random or fixed effect models were applied for combining the primary estimates. Some of the suspected factors for heterogeneity were assessed using meta-regression models. Furthermore, subgroup analyses were performed based on publication date, study groups, and publication language. In addition, sensitivity analysis was conducted to assess the effect of each primary study on the total estimates. Publication bias was conducted with Egger test. Point and pooled estimates of TST results as well as their 95% confidence intervals (CIs) were illustrated by forest plots. During the primary search, 14,809 evidences reporting the results of Iranian TST surveys were identified which were reduced to 386 after restricting the search strategy as well as duplicate exclusion. Investigating the titles and abstracts, 308 irrelevant articles were detected, and reviewing full texts, 33 irrelevant studies were removed. In addition, three new studies were detected eligible and added to the search results. During the investigation of inclusion/exclusion criteria and quality assessment, 15 papers were omitted and 33 papers were remained for the final meta-analysis [Figure 1]. The publication dates of the primary studies varied from 1996 for the study conducted by Sadeghi reported the prevalence of positive PPD among general population to 2015 for the study conducted by Moosazadeh reporting the prevalence of latent TB infection as of 42.8% among family members of TB cases [Table 1]. The study populations were general population (four studies), health staff (six studies), medical students (two studies), household close contacts (three studies), immunocompromised patients (eight studies including six studies among hemodialysis patients, one study among diabetic patients, and one study among lung and cardiac transplant candidates), HIV/AIDS cases (four studies), populations with risky behaviors (two studies), general population plus medical students and staff (one study), HIV/AIDS cases plus those with risky behaviors (one study), and general population plus health workers (two studies) [Table 2]. TST results were read after 48 h (four studies) or 72 h (29 studies). The cutoff point for detecting latent TB infection had been considered 5 mm for HIV/AIDS cases and >10 mm for other groups. Minimum and maximum frequencies of positive TST reactions were 4% in the study conducted by Aslani among general population in 2004 and 55.5% in the study conducted by Sadeghi among general population in 1996, respectively [Table 1]. As illustrated in [Figure 2], the prevalence of positive (>10 mm) TST reactions among Iranian people aged over 10 using random effect model was estimated as of 26.2% (95% CI: 19.6–32.8). Frequency of >15 mm TST reactions was reported in six studies varied between 2.5% among general population in Ahanjan study and 30.1% among health staff in Nader study. Based on random effect model, the total frequency of >15 mm TST reaction was estimated as of 11.2% (95% CI: 10.01–12.4). Meta-regression models showed that publication date (P = 0.007) and study groups (P = 0.04) had significant influence on the heterogeneity [Table 3]. Subgroup analysis indicated that health staffs (38.9%) and household close contacts (35.9%) had the most prevalence of positive TST, while medical students had lower latent TB infection rates than the other groups (13.4%). The total prevalence of latent TB infection according to the studies carried out before and after 2007 was estimated as of 35.5% (18.9–51.9) and 26.2% (19.6–32.8), respectively. Out of the studies entered into the meta-analysis, 20 papers had been written in English and 13 papers written in Persian. The total estimates of positive TST according to these studies were 25.1% (15.6–34.6) and 27.6% (19.3–35.8), respectively. There were no significant differences between the results based on the publication language. Results of the sensitivity analysis showed that Besharat, Sadeghi, and Aslani studies had considerable influence on the total estimate [Figure 3]. 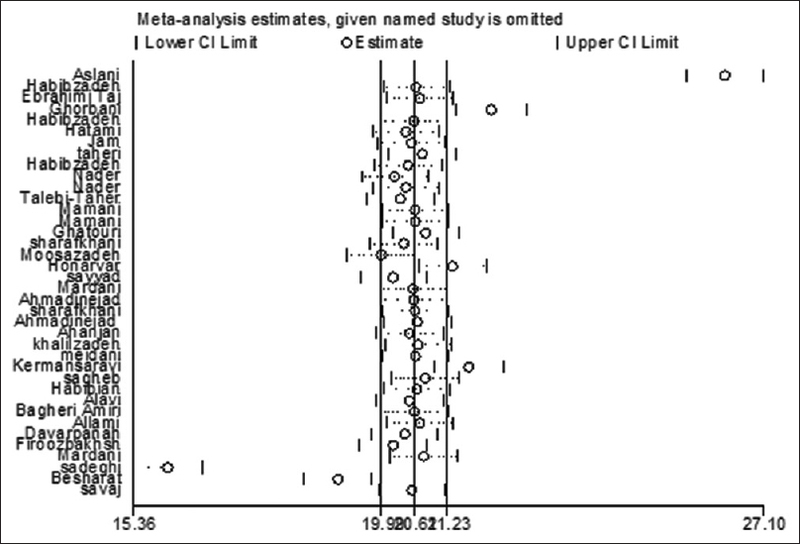 Egger test results showed no evidence of publication bias (β = 4.3, P = 0.144). Our study estimated the total prevalence (95% CIs) of positive TST among all study groups, general population, health staffs, medical students, household close contacts, immunocompromised patients, HIV/AIDS cases, and people with risky behaviors as of 26.2% (19.6–32.8), 25.4 (4.8–46.1), 38.9% (27.4–-50.4), 13.4% (9.9–16.7), 35.9% (16.4–55.5), 13.7% (8.4–18.9), 29.4% (21.2–37.7) and 14.6% (3.9–25.3), respectively. The prevalence of latent TB infection among general population in China and the USA has been estimated as of 19.98% (2015) and 4.4% (2016), respectively. Both of these estimates were lower than that estimated in the current meta-analysis. According to the results of a study carried out in Malaysia in 2011, the prevalence of latent TB infection among health-care workers was 10.6% (8.6–12.6), which was considerably lower than that estimated in the current meta-analysis. The observed difference might be partially due to the effect of false-positive results following previous BCG vaccination and exposure to the none TB Mycobacterium. The situations of TB infection/disease as well as health development status are similar in the two countries. Moreover, the above-mentioned findings in Malaysia are estimated by a single primary study and maybe some other surveys provide different results while the estimate of our study has been obtained by combination of the results of multiple surveys. Another study conducted in western Kenya in 2015 showed the prevalence of positive TST among health-care workers as of 60%, which might be due to the high prevalence of HIV/AIDS in this area. It should be noted that 22% of the population living in this region were HIV positive. Results of a meta-analysis showed that the prevalence of latent TB infection among medical and nursing students in the low- and middle-income countries was 12%, which is similar to that observed in the current meta-analysis. That study reported the risk of TB infection among health-care workers as of 25–5361 per 100,000 population. In South Africa, the prevalence of latent TB infection among medical students was reported as of 26.6%, which was higher than our estimates. Fox et al. in 2013 combined the results of 76 studies carried out among 60,557 household close contacts with TB cases in low- and middle-income countries and reported the prevalence of latent TB infection as of 51.5% (47.1–55.8), which was higher than Iran's estimate. They also estimated the prevalence in high-income countries combining the results of 92 TST surveys as of 28.1% (24.2–32.4), which was lower than that of Iran. Therefore, it seems that the TB infection rate among Iranian household close contacts is in the middle of that among low- and high-income countries. Obviously, there is a great heterogeneity between the incidence and prevalence of TB and HIV/AIDS as well as vaccination status in low- and high-income countries. In Shanghai, the prevalence of TB infection (17.2%) was lower than that of Iran; however, the survey was conducted among people other than close contacts. Latent TB infection among household close contacts in Korea (38%) in 2014 was similar to the rates observed in Iran, while the corresponding rate in Australia (31.4%) was higher than Iran. In northern parts of Iran, latent TB infection rate was the same among male and female close contacts (41.8% vs. 43.7%, respectively). Deiss et al. conducted a systematic review in 2009 and showed that latent TB infection among IV drug users varied between 10% and 59% as similar to the rates represented in the current meta-analysis. The addiction not only weakens the immune system but also leads to other socioeconomic problems such as homelessness, imprisonment, and poor socioeconomic and sanitary status. Another study in Taiwan in 2013 showed that 85% of addicts under methadone replacement therapy were positive for TST which is expectable in such groups. Mamani et al. reported that the prevalence of latent TB infection among Iranian intravenous drug users was 18.3%, which was similar in both genders. Selwyn found that the results of TST survey among HIV-positive patients were in keeping with the results of our meta-analysis. Based on the results of TST studies conducted by Foster et al., Manuel et al., Seyhan et al., and Bartalesi et al., the prevalence of latent TB infection among patients undergoing hemodialysis was estimated as of 13%, 24.2%, 34%, and 19%, respectively. There are different reasons for the heterogeneity between the results of Iranian surveys with those conducted in other countries such as prevalence of TB infection/disease, time duration of close contact with active TB cases, non-TB Mycobacterium, dose and quality of PPD injected, the level of the immune responses, BCG vaccination coverage, and study age group among different countries. It should be mentioned that in a region with 90% TB infection prevalence, the positive predictive value for TST is 99%. This value is 15% in a region with 1% infection prevalence. It causes high false-positive results. A systematic review combined the results of 22 TST surveys carried out among pregnant women in the USA, China, Tanzania, and Chile. Such subgroups were not considered in the Iranian TST surveys. The significant heterogeneity observed between the results of the primary studies was one of the limitations in the current meta-analysis which was not changed after subgroup analysis based on population subgroups and publication date. It might be due to other potential factors influenced the heterogeneity such as area of residence and methodology. We did not investigate the effect of these factors due to the lack of relevant data in the primary studies. Another limitation of our meta-analysis was that the primary evidences were collected from only 13 provinces, most of which were conducted in the capital of Iran. While, among the most affected areas such and Sistan and Baluchestan (southeast Iran) and Golestan (northern Iran), only one TST survey had been carried out which met our inclusion criteria. Our meta-analysis showed that there is a great variation in the results of TST among different population groups in Iran. We also found that health-care workers and household close contacts (family members of TB cases) were more infected than the other study groups. Since TB control programs such as active case finding are routinely conducted among household close contacts, HIV/AIDS cases, and immunocompromised patients, other high-risk groups including health-care workers should be taken into consideration in these preventive programs. In addition, due to the above-mentioned variation in the TB infection estimates in different provinces, further studies are recommended to be carried out with more precise methodologies among all subgroups in geographical areas with different endemicities. Nadjane Batista Lacerda S, Cristina de Abreu Temoteo R, Maria Ribeiro Monteiro de Figueiredo T, Darliane Tavares de Luna F, Alves Nunes de Sousa M, Carlos de Abreu L, et al. Individual and social vulnerabilities upon acquiring tuberculosis: A literature systematic review. Int Arch Med 2014;7:35. Moosazadeh M, Nasehi M, Bahrampour A, Khanjani N, Sharafi S, Ahmadi S, et al. Forecasting tuberculosis incidence in Iran using Box-Jenkins models. Iran Red Crescent Med J 2014;16:e11779. Iroezindu MO, Ofondu EO, Mbata GC, van Wyk B, Hausler HP, Dh A, et al. Factors associated with prevalent tuberculosis among patients receiving highly active antiretroviral therapy in a Nigerian tertiary hospital. Ann Med Health Sci Res 2016;6:120-8. Tudor C, Van der Walt ML, Margot B, Dorman SE, Pan WK, Yenokyan G, et al. Occupational risk factors for tuberculosis among healthcare workers in Kwazulu-Natal, South Africa. Clin Infect Dis 2016;62 Suppl 3:S255-61. 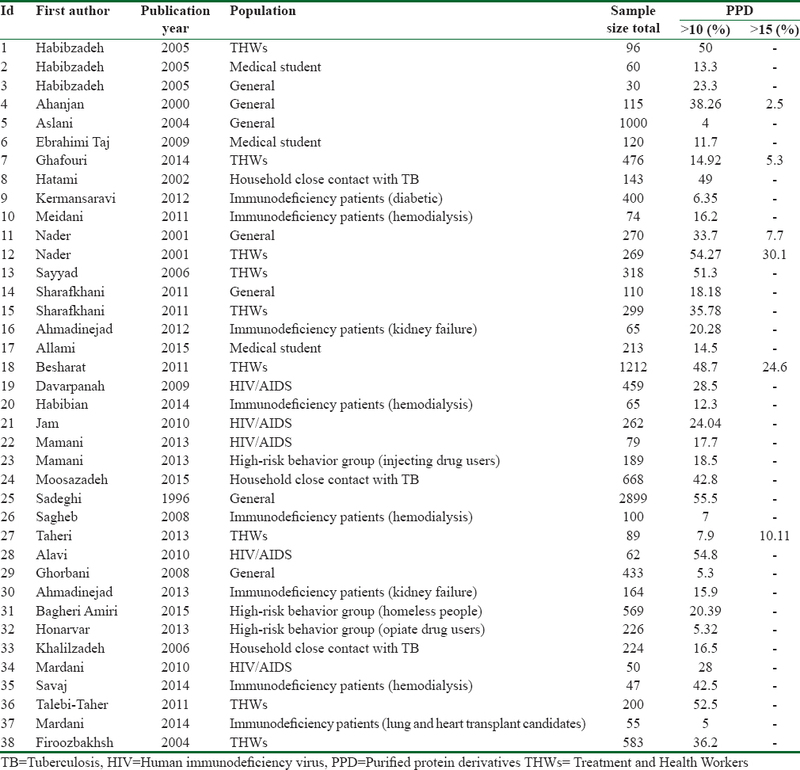 Moosazadeh M, Bahrampour A, Nasehi M, Khanjani N. The incidence of recurrence of tuberculosis and its related factors in smear-positive pulmonary tuberculosis patients in Iran: A retrospective cohort study. Lung India 2015;32:557-60. Nasehi MM, Moosazadeh M, Amiresmaeili M, Parsaee M, Nezammahalleh A. The epidemiology of factors associated with screening and treatment outcomes of patients with smear positive pulmonary tuberculosis: A population-based study. J Mazandaran Univ Med Sci 2012;21:9-18. World Health Organization. Global Tuberculosis Report 2015; 2015. Available from: http://www.who.int/tb/publications/global_report/en/. [Last accessed on 2016 Oct 21]. Yazdani-Charati J, Rezai MS, Fendereski A, Mohammadi S, Alipour N. Treatment delay and total delay among pulmonary tuberculosis patients in the North of Iran: Application survival data analysis. Tanaffos 2017;16:13-21. Moosazadeh M, Khanjani N, Nasehi M, Bahrampour A. Predicting the incidence of smear positive tuberculosis cases in Iran using time series analysis. Iran J Public Health 2015;44:1526-34. Moosazadeh M, Khanjani N, Bahrampour A. Seasonality and temporal variations of tuberculosis in the North of Iran. Tanaffos 2013;12:35-41. Ruslami R, Aarnoutse RE, Alisjahbana B, van der Ven AJ, van Crevel R. Implications of the global increase of diabetes for tuberculosis control and patient care. Trop Med Int Health 2010;15:1289-99. Haghdoost AA, Afshari M, Baneshi MR, Gouya MM, Nasehi M, Movahednia M, et al. Estimating the annual risk of tuberculosis infection and disease in Southeast of Iran using the bayesian mixture method. Iran Red Crescent Med J 2014;16:e15308. Moosazadeh M, Khanjani N, Parsaee M. The prevalence of latent tuberculosis infection and smear positive pulmonary tuberculosis in people with household close contact with tuberculosis in North of Iran. Iran J Med Sci 2015;40:161-5. Jensen PA, Lambert LA, Iademarco MF, Ridzon R, CDC. Guidelines for preventing the transmission of Mycobacterium tuberculosis in health-care settings, 2005. MMWR Recomm Rep 2005;54:1-41. Moosazadeh M. Meta-analysis of prevalence of smoking in 15-64-year-old population of West of Iran. Int J Prev Med 2013;4:1108-14. Moosazadeh M, Lankarani KB, Afshari M. Meta-analysis of the prevalence of helicobacter pylori infection among children and adults of Iran. Int J Prev Med 2016;7:48. Moosazadeh M, Amiresmaili M, Aliramezany M. Prevalence of G6PD deficiency in Iran, a mata-analysis. Acta Med Iran 2014;52:256-64. Vandenbroucke JP, von Elm E, Altman DG, Gøtzsche PC, Mulrow CD, Pocock SJ, et al. Strengthening the reporting of observational studies in epidemiology (STROBE): Explanation and elaboration. Int J Surg 2014;12:1500-24. Higgins JP, Thompson SG. Quantifying heterogeneity in a meta-analysis. Stat Med 2002;21:1539-58. Chen C, Zhu T, Wang Z, Peng H, Kong W, Zhou Y, et al. High latent TB infection rate and associated risk factors in the Eastern China of low TB incidence. PLoS One 2015;10:e0141511. Mancuso JD, Diffenderfer JM, Ghassemieh BJ, Horne DJ, Kao TC. The prevalence of latent tuberculosis infection in the United States. Am J Respir Crit Care Med 2016;194:501-9. Rafiza S, Rampal KG, Tahir A. Prevalence and risk factors of latent tuberculosis infection among health care workers in Malaysia. BMC Infect Dis 2011;11:19. Agaya J, Nnadi CD, Odhiambo J, Obonyo C, Obiero V, Lipke V, et al. Tuberculosis and latent tuberculosis infection among healthcare workers in Kisumu, Kenya. Trop Med Int Health 2015;20:1797-804. Joshi R, Reingold AL, Menzies D, Pai M. Tuberculosis among health-care workers in low- and middle-income countries: A systematic review. PLoS Med 2006;3:e494. van Rie A, McCarthy K, Scott L, Dow A, Venter WD, Stevens WS, et al. Prevalence, risk factors and risk perception of tuberculosis infection among medical students and healthcare workers in Johannesburg, South Africa. S Afr Med J 2013;103:853-7. Fox GJ, Barry SE, Britton WJ, Marks GB. 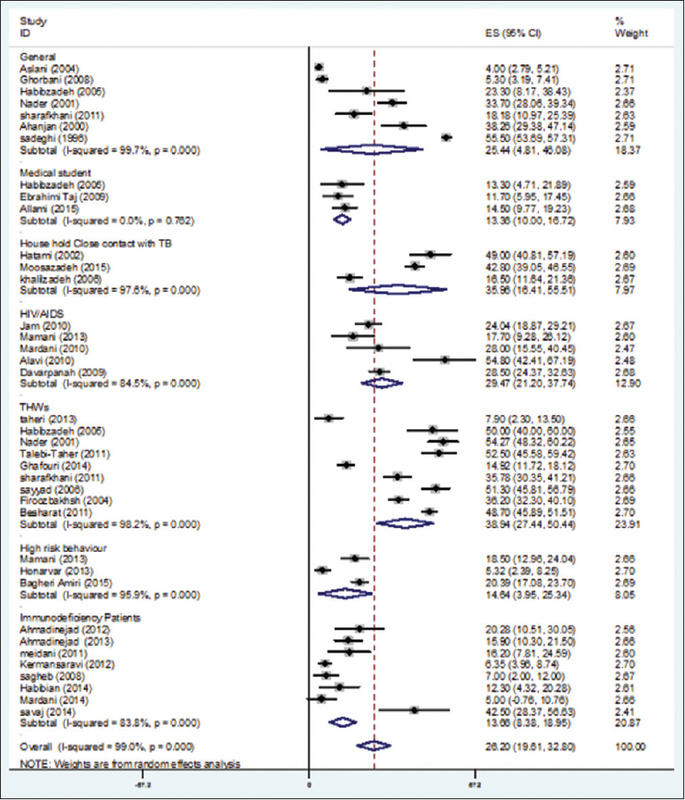 Contact investigation for tuberculosis: A systematic review and meta-analysis. Eur Respir J 2013;41:140-56. Xu J, Hu Y, Jiang W, Hong J, Tang L, Yang M, et al. Prevalence and risk factors of latent tuberculosis infection in close contacts of tuberculosis patients among non-resident populations in Shanghai, China. Zhonghua Jie He He Hu Xi Za Zhi 2016;39:25-9. Lee SJ, Lee SH, Kim YE, Cho YJ, Jeong YY, Kim HC, et al. Risk factors for latent tuberculosis infection in close contacts of active tuberculosis patients in South Korea: A prospective cohort study. BMC Infect Dis 2014;14:566. Moyo N, Tay EL, Denholm JT. Evaluation of tuberculin skin testing in tuberculosis contacts in Victoria, Australia, 2005-2013. Public Health Action 2015;5:188-93. Deiss RG, Rodwell TC, Garfein RS. Tuberculosis and illicit drug use: Review and update. Clin Infect Dis 2009;48:72-82. Yen YF, Hu BS, Lin YS, Li LH, Su LW, Chuang P, et al. Latent tuberculosis among injection drug users in a methadone maintenance treatment program, Taipei, Taiwan: TSPOT.TB versus tuberculin skin test. Scand J Infect Dis 2013;45:504-11. Mamani M, Majzoobi MM, Torabian S, Mihan R, Alizadeh K. Latent and active tuberculosis: Evaluation of injecting drug users. Iran Red Crescent Med J 2013;15:775-9. Selwyn PA, Hartel D, Lewis VA, Schoenbaum EE, Vermund SH, Klein RS, et al. A prospective study of the risk of tuberculosis among intravenous drug users with human immunodeficiency virus infection. N Engl J Med 1989;320:545-50. Foster R, Ferguson TW, Rigatto C, Lerner B, Tangri N, Komenda P, et al. 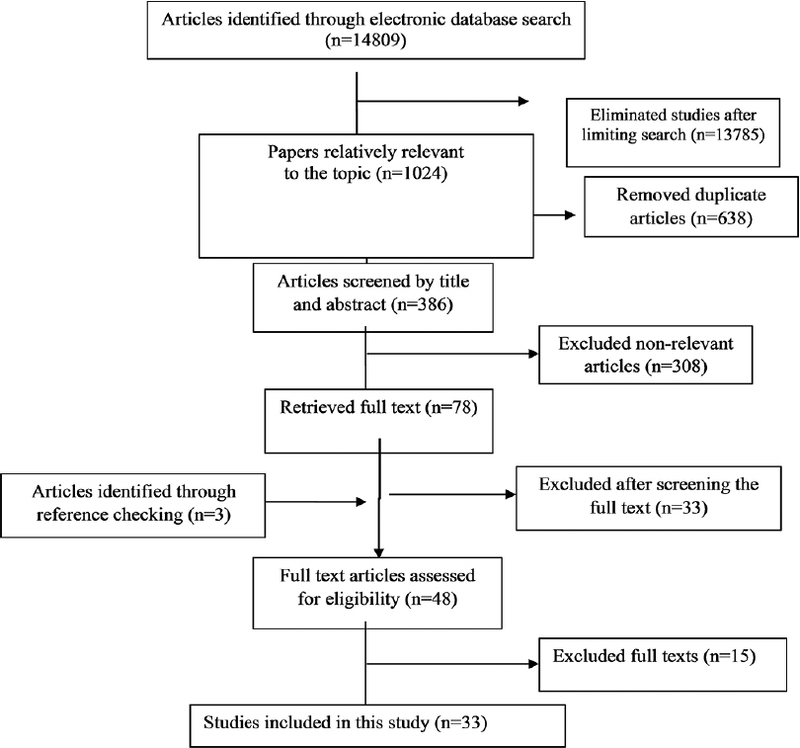 A retrospective review of the two-step tuberculin skin test in dialysis patients. Can J Kidney Health Dis 2016;3:28. Manuel O, Humar A, Preiksaitis J, Doucette K, Shokoples S, Peleg AY, et al. Comparison of QuantiFERON-TB gold with tuberculin skin test for detecting latent tuberculosis infection prior to liver transplantation. Am J Transplant 2007;7:2797-801. Seyhan EC, Sökücü S, Altin S, Günlüoǧlu G, Trablus S, Yilmaz D, et al. Comparison of the QuantiFERON-TB gold in-tube test with the tuberculin skin test for detecting latent tuberculosis infection in hemodialysis patients. Transpl Infect Dis 2010;12:98-105. Bartalesi F, Vicidomini S, Goletti D, Fiorelli C, Fiori G, Melchiorre D, et al. QuantiFERON-TB gold and the TST are both useful for latent tuberculosis infection screening in autoimmune diseases. Eur Respir J 2009;33:586-93. Ghafouri M, Seyed Sharifi S. Prevalence of latent tuberculosis infections in Health Care Workers (HCW) in Mashhad Hospital. J North Khorasan Univ Med Sci 2015;6:829-40. Malhamé I, Cormier M, Sugarman J, Schwartzman K. Latent tuberculosis in pregnancy: A Systematic review. PLoS One 2016;11:e0154825.